IC 4592 (the Blue Horsehead) is a reflection nebula in the constellation Scorpius. 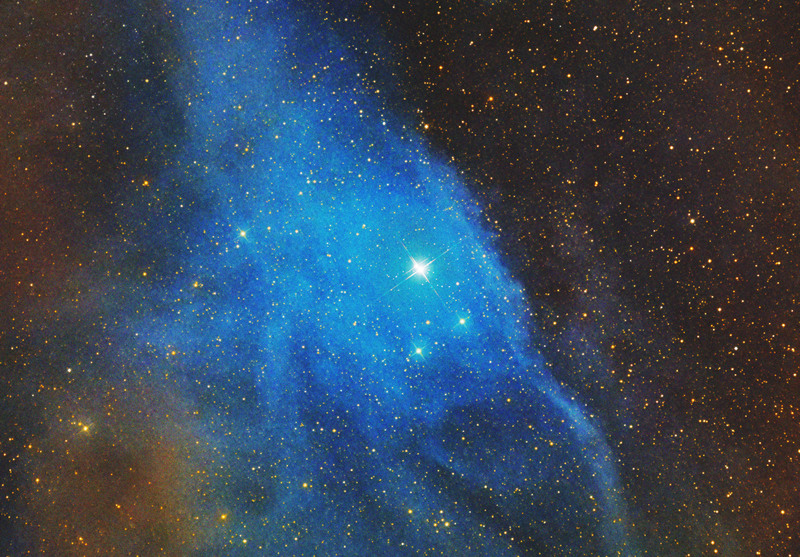 Situated in the northern part of the constellation, it is a vast nebulous system that receives blue light of its closest star, a blue magnitude 4.13 subgiant ν Scorpii, which light the nebula is reflecting. Nearby is also the star HD 145501, a blue star of magnitude 6.55 that is paired with ν Scorpii. Both stars are located in the region around Rho Ophiuchi cloud complex, where star formation takes place. IC 4592 incorporates the nebulous object cataloged as vdB 100, a portion of brighter gas visible near ν Scorpii; all illuminated cloud is actually only a small part of the gas present in the region, making up the great dark cloud LDN 1721. IC 4592 is the part of this cloud most exposed to the radiation of the star ν Scorpii, which is only 1.7 parsecs (5.5 light years) away. Inside of the cloud there are at least 25 M⊙ of molecular hydrogen. The distance of the nebulous system from the Earth is estimated to be 134 parsecs (436 ly).